I bought my house in Hampden in 2000. Yep, my neighborhood’s gotten better and better every year. And, when you look at the restaurants, even more so. I got into cooking later in life…in my mid-30s, Julia Child, Jacques Pepin, America’s Test Kitchen and Ina Garten all taught me how to cook. And then in my 40s, Hampden got new restaurant after new restaurant. When I moved in, there was Holy Frijoles, Cafe Hon, Golden West and a few others. I still miss Mamie’s lobster night. Now? We have The Food Market, Dylan’s Oyster Cellar, Arômes, Paulie Gee’s Pizza and the list goes on. And on. Saturated? Maybe, but the good ones will stay. Quite possibly one of the best places to open in years? The Bluebird Cocktail Room. First, let’s not call this a hipster bar. I’m so tired of that word – it’s lazy. 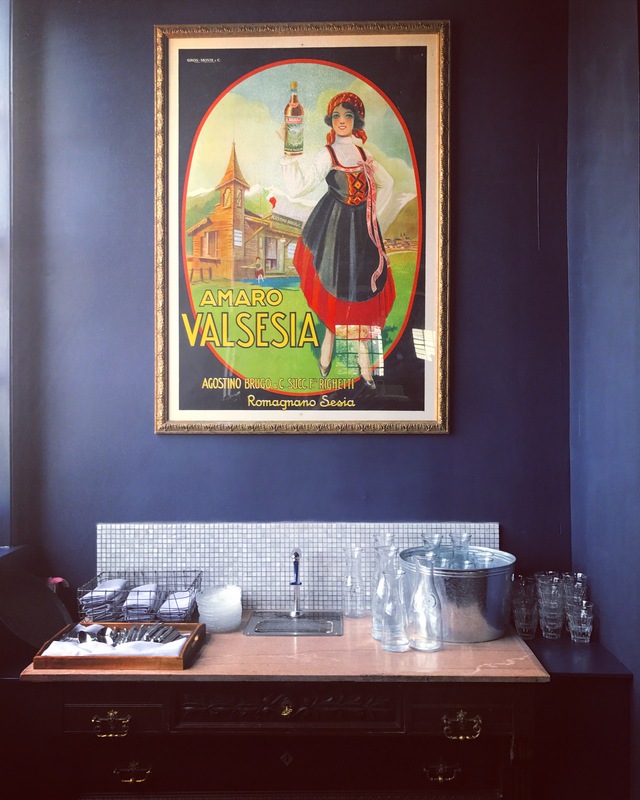 To me, it’s a bar run by two guys – Paul Benkert and Ben Poole, both former Woodberry Kitchen bar staff – who pay particular attention to things that matter to them, creating a specific kind of experience. And I like that. A lot. Another thing that makes The Bluebird a little different? It’s never overcrowded. If you arrive (mainly on weekend nights) at prime bar time you might not get in right away…there might be a short wait. If there’s a long wait and you have a bunch of people in your group, they can text you. They want the people who are already upstairs to enjoy the experience, not feel crowded, not feel rushed. Also, if you’re sitting at a table, you go up to the bar and order your drinks and food at a dedicated queue and they bring it over to you. So far, I’ve only sat at the bar, but lots of people have told me they liked the whole queue thing. And when the bar is packed, having bartenders whose sole focus is to bang out cocktails – vs taking orders, payments, etc – seems pretty smart. I like the idea of sitting at a community table or even a two top and not feeling like you have people standing at your table. It feels a little bit grown up. The physical menu is a little book, which reflects the bar’s literary theme – and is divided into four chapters. Chapter one: simple, lighter, more refreshing drinks like the vodka-based Mrs. Dalloway. Chapter two we’ll call crushers: a little more boozy, a little more complex. 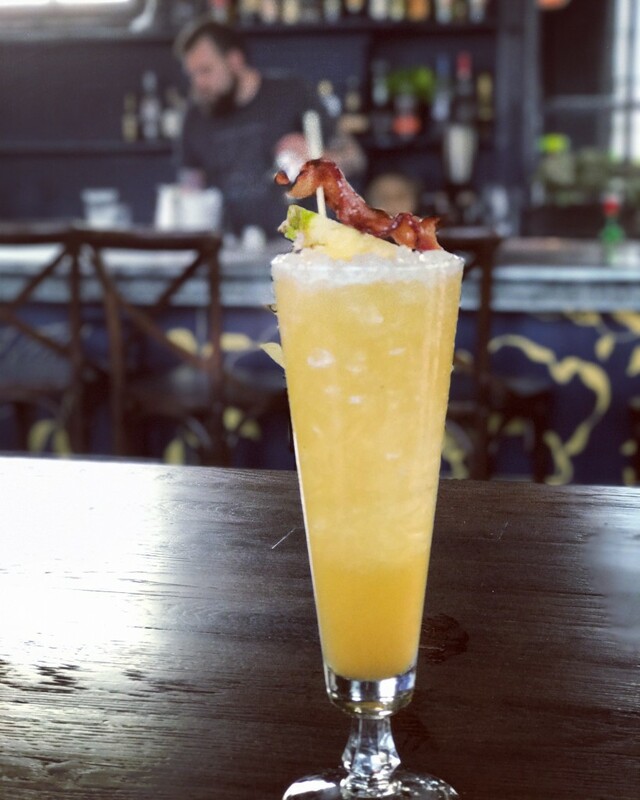 I loved the Hemingway Daiquiri and they surely make a lot of the Pig Island, which is two kinds of rum, falernum, bacon syrup, pineapple juice and it’s garnished with a piece of bacon that’s been candied in pineapple syrup. My friend got the Jack Rose – Calvados apple brandy, housemade grenadine, lemon juice with an apple garnish. For me, it was a little too sweet, but she loved it and ordered a second. Chapter three is where you begin to wind down, sip a little. This is where you have the Old Fashioned and the Handsome Devil. One that I have not had in this chapter is the Bijou and I love this part of the description so much: “We prefer the more romantic interpretation of the history of the Bijou equating the ingredients of the drink to jewels: diamonds for the gin, rubies for the vermouth and emeralds for the green Chartreuse.” Then, finally, in chapter four we roll into the after-dinner options including absinthe, etc. One particularly memorable drink in this section is the Exploration #4, which has Angostura bitters as the base spirit (instead of the usual dashes added), which I love. Plus lime, house grenadine, sugar, a little heavy cream and an egg white. If you know me, you know I am a sucker for an egg white. This drink was a great way to end the night, which thankfully, involved walking home. Details. Ice, for example. I’m okay with nerding out over ice. 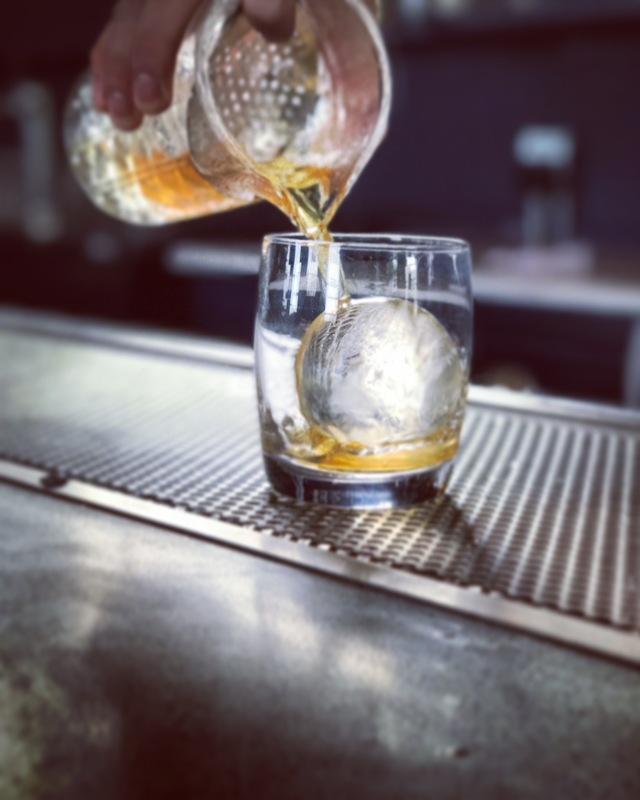 I love learning things from bartenders…like which drinks get which kinds of ice, why certain ingredients go together, how they create various components, where do they come up with the names? To me, that’s the good stuff. I’ve learned that one of the only times I like crushed ice is in a Mint Julep. And, in an Old Fashioned, I like a big hunk of ice. 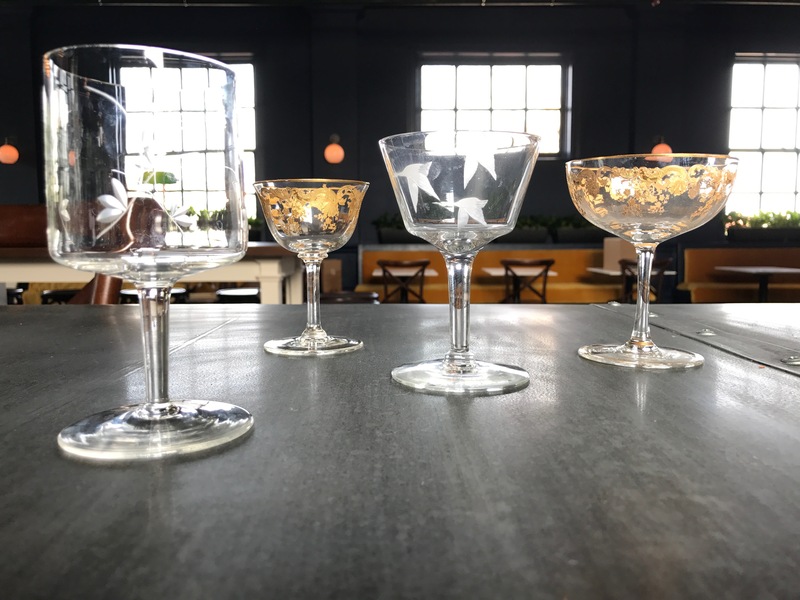 And, glassware is key. I’ve always admired The Brewer’s Art, for example, for how they serve different beers in different glasses. At home, I have different glassware for different drinks, but I tend not to overthink it too much. However, when I’m out, I like to know that the folks making my drink pay attention to the details. I go out a lot and I love when I can tell that a bar is set up just right and the bartender takes a lot of pride – in a good way, not a pretentious way – in their work. One of my most favorite (and maybe weird) things is when the water is simply from the tap, but chilled in a refrigerator. No ice. I know, it’s super specific, but I love it. 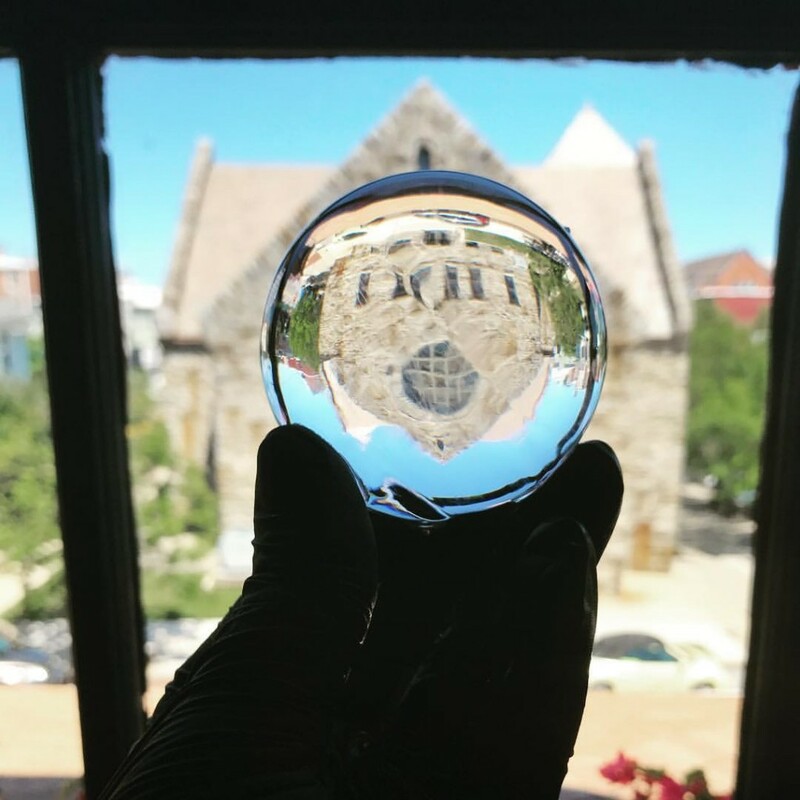 So, you can see – little things matter to me. The drinks range in price from a $5 happy hour cocktail or glass of wine and $2 Natty Boh to a highball with Nikka Coffey Japanese Whisky for $19. I can’t say that I would ever order that highball, as I’m not sure my palate would fully appreciate it – and I don’t have that kind of budget. I have a few friends who will absolutely love that drink, but I’m very happy with the Old Fashioned with Old Grand-dad Bourbon, sugar, vanilla and bitters. And a BIG hunk of ice. Gimme. So far, I’ve had almost all of the drinks. I’ve been four times (twice before they opened and twice as a guest) and I have three favorites. 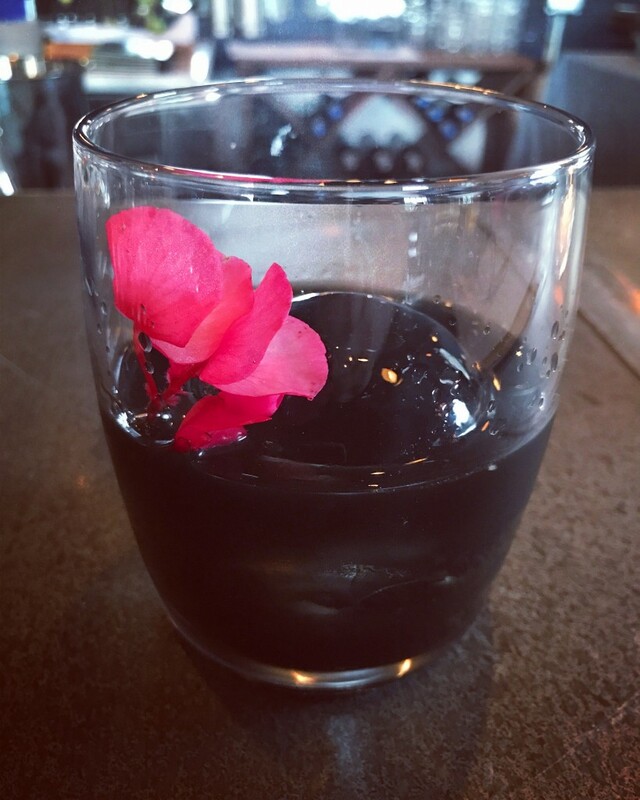 The Old Fashioned, the Mint Julep and surprisingly, the Handsome Devil, which is made with Barr Hill Tomcat (barrel aged) gin, wildflower honey, Amaro and activated charcoal. I’m a little over the activated charcoal craze already (kinda like avocado toast, I don’t hate eating it, I’m just tired of seeing it everywhere) but this drink is smooth and easy and well, I fell in love. And the jet black cocktail is simply stunning, especially when they add the huge clear sphere of ice into it. And, Ben told me, “I thought we might sell a couple of these a night. But it’s been really amazing to see that drink take off.” Also, on my last visit, our bartender, Dan, said it was his favorite and I can definitely see why. Also, I’m told that charcoal helps with hangovers, so perhaps it’s just a win-win. 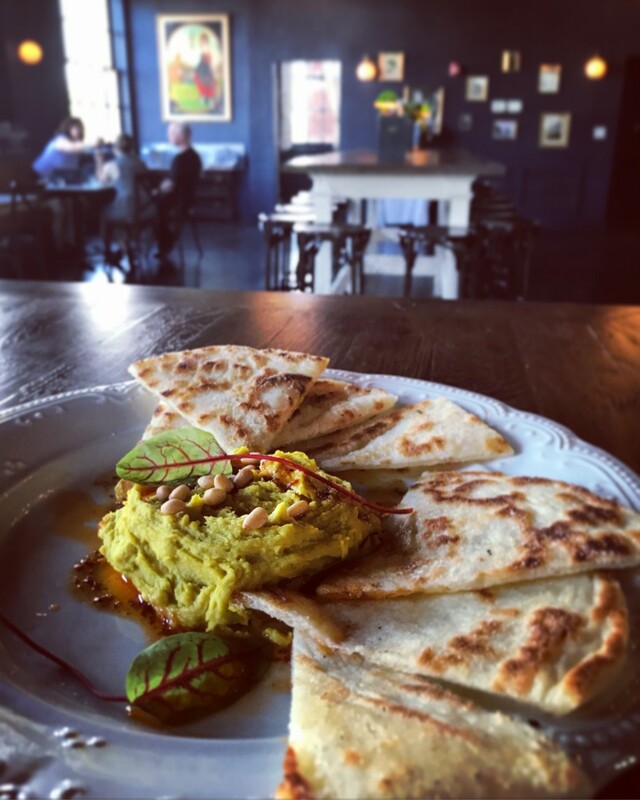 With so many dining options, you really could just hit The Bluebird before or after dinner. But if you’re like me and really enjoy sharing lots of small dishes, snacks, bites…you really can eat dinner there. 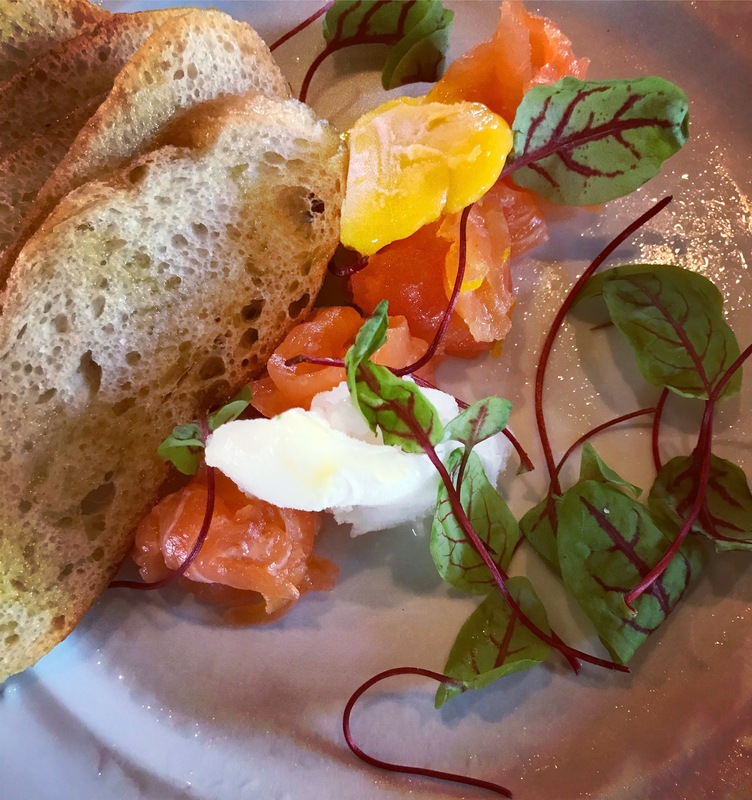 I loved the yellow lentil hummus, ‘ndjua spread, gin cured salmon, charcuterie (the terrine was quite nice) and smoked gouda arancini. 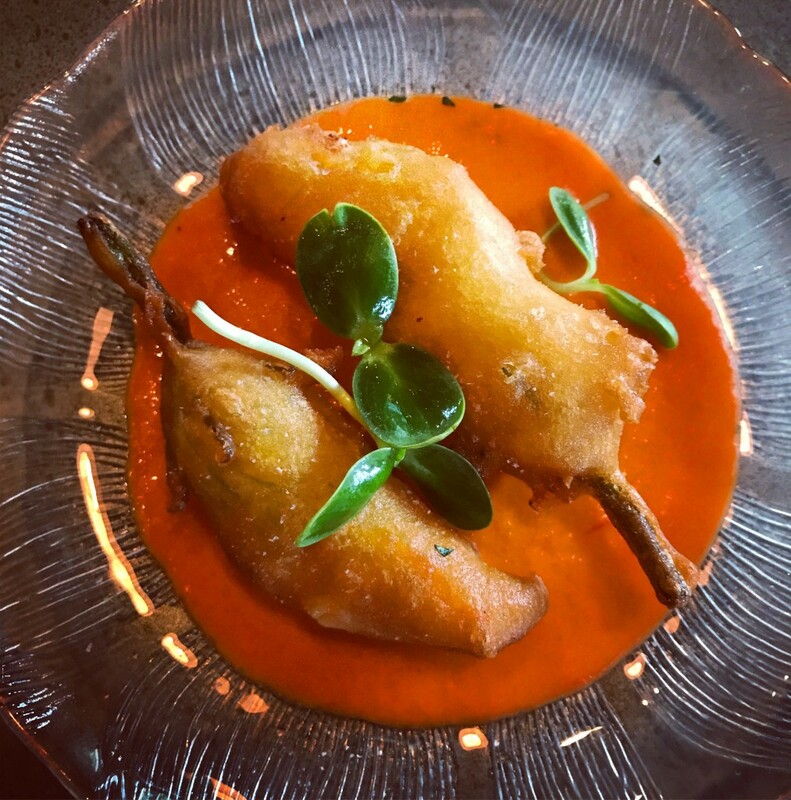 I liked the ricotta stuffed squash blossoms, but wish they had a little heat. I am excited to go back and try a few more substantial dishes like the steak frites, cheeseburger and also the grilled calamari. Someone near us ordered the cheese plate and it looked lovely. I’m also a sucker for a cheese plate. 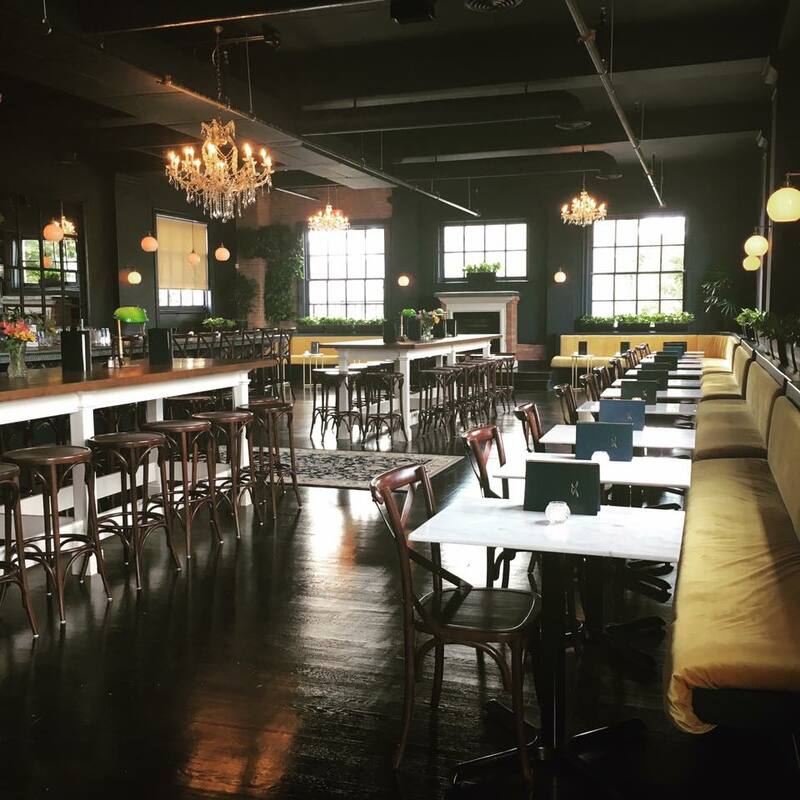 The Bluebird Cocktail Room has only been open since July, but so far, so good. And more to come, for sure – fall cocktails are just around the corner. For now, Ben and Paul, you have created my new favorite hang. I love all of these places in Hampden and we often go to several in one night. 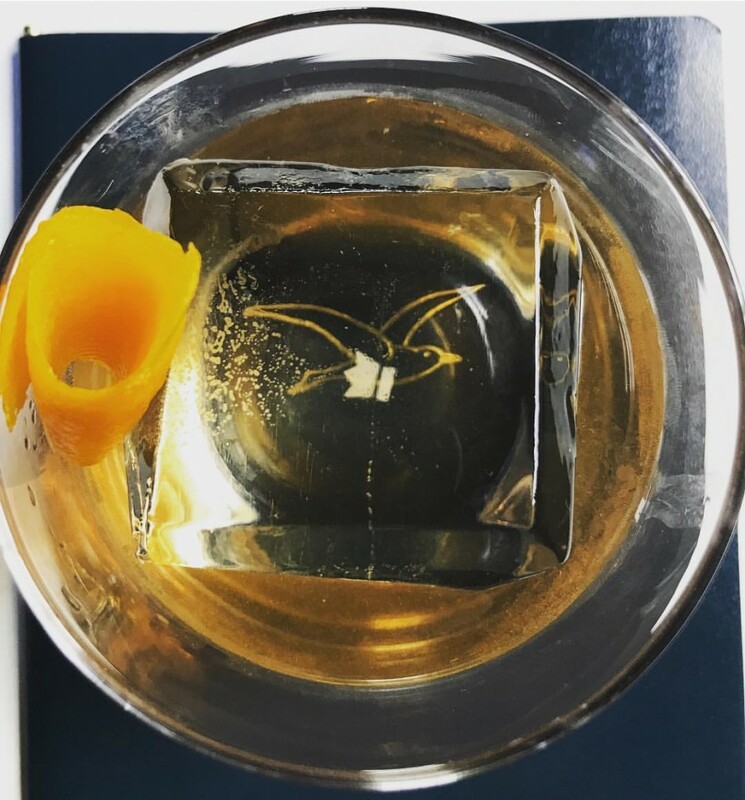 I love the ice at the Bluebird and Clavel (Remington/Old Goucher) because they hand carve it so you want to savor the drink knowing what went into the ice. You live in a great neighborhood.